Chromium Supreme™ is the unique formulation that combines chromium with vanadium, selenium, zinc and manganese for the support of normal sugar metabolism. We use ChromeMate® brand chromium because of its high biological activity called Glucose Tolerance Factor. ChromeMate® brand chromium GTF is an organic chromium complex that contains niacin as well as cystiene and other nutrients. It is a trace mineral that supports the healthy metabolism of proteins, carbohydrates and fats. Selenium (as Selenium SeLECT® L-selenomethionine) supports actions such as stimulating glucose uptake and regulating metabolic processes including glycolysis, gluconeogenesis, fatty acid synthesis, and the pentose phosphate pathway. Zinc (as TRAACS® Zinc Glycinate Chelate) is a component in support of insulin. It is required for DNA synthesis, critical to cellular replication organ and tissue cells involved in maintaining healthy blood sugar levels. Manganese (as TRAACS® Manganese Glycinate Chelate) supports utilization of glucose for energy and normal pancreas functioning. Vanadyl sulfate is a compound of vanadium and can that supports reduction of glucose in the blood stream and support delivery of glucose to the cells where needed for energy. 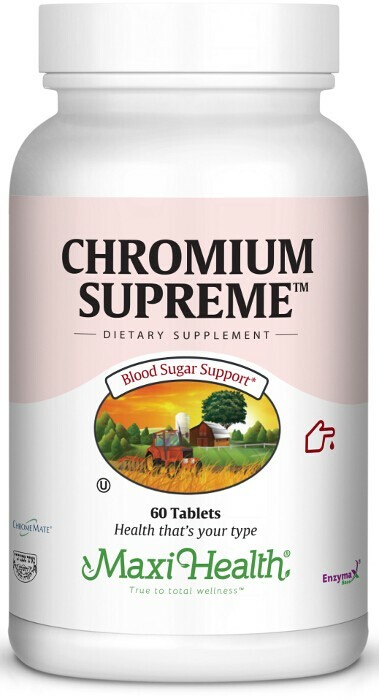 To support energy metabolism and blood sugar regulation, try Chromium Supreme™ from Maxi-Health Research®. Take one (1) tablet one to three times daily, or as directed. For best results, take with Maxi Cinnacaps Complex™. Dicalcium phosphate, microcrystalline cellulose, stearic acid, croscarmellose sodium, Enzymax® (calcium carbonate, bromelain, papain, lipase, amylase, protease, silica), aqueous film coating (purified water, hydroxypropyl methylcellulose, vegetable glycerin). This product contains no animal products, soy, wheat, gluten, salt, milk, yeast, artificial flavors, colorings or preservatives. Enzymax®, a vital digestive enzyme complex, is a registered trademark of Maxi Health Research® LLC. • Chromemate®, a patented, biologically active oxygen-coordinated niacin-bound chromium complex, is a trademark of InterHealth Nutritionals Inc. • Selenium SeLECT® is a registered trademark of Sabinsa Corporation. • TRAACS® is a registered trademark of Albion Laboratories, Inc.
My husband who is on a low carb diet purchased Chromium Supreme and experienced his cravings for starchy foods vanish in a short time. This enabled him to keep his weight loss program craving free. Thank you for helping my husband to continue leading a healthier lifestyle.